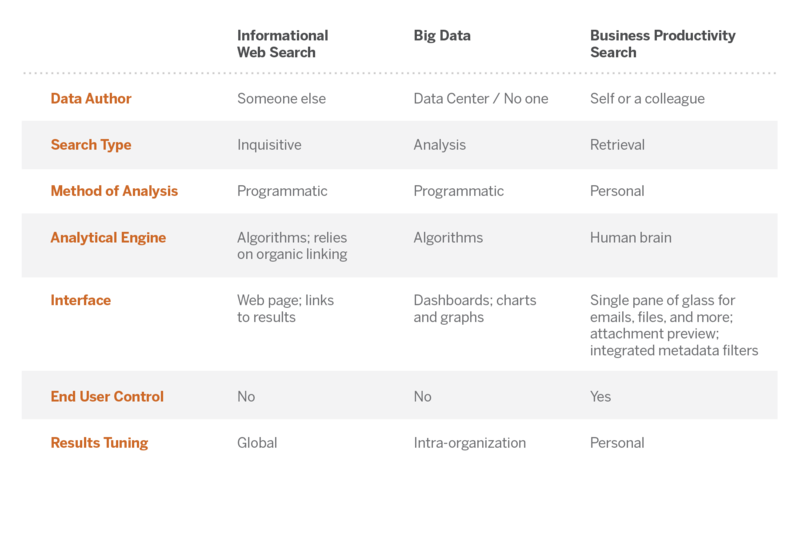 In last week’s post about what we are looking for with enterprise search, I mentioned what we call the Google paradigm. A reader asked me to be more specific about what the Google paradigm actually is and it’s a worthy request. The Google paradigm is actually a summation of the resulting perceptions based on the popularity of Google; those perceptions are that enterprise search is as easy as Google web search, and that a central index of an enterprise is the right way to do enterprise search. The result of these perceptions is an approach to enterprise search that has not solved the problem of allowing business workers to easily and quickly find the information they are looking for. It is important to note that web search is not the same as enterprise search, and therein lies the major problem with the perceptions caused by the Google paradigm. Google is an excellent tool for informational web search – I use it frequently when researching various topics that I need to learn more about. The point is that Google is for Web search, which uses organic linking (looking at the number of sites that link to a particular page) to determine the rank order of results. That approach provides zero value in the enterprise because the users typically have more than an inkling of what they are looking for, and perhaps have specific criteria they know are relevant, and thus require an interface that allows them to quickly filter the result down to a manageable number. But, in reality, enterprise search is often synonymous with Google – the web search paradigm. There is a tendency to think of search as easy. After all, Google completes search queries for users; it is easy to assume that technology will eventually just know what users are looking for and offer it up to them. This message is reinforced in the age of Big Data and business intelligence. There is a fascination with the stunning dashboards we see in CRM and SFA applications. There is a belief that analytics will replace any need to search and find information. While analytics will certainly help many business processes, its biggest impacts will be in feeding structured data into business processes and informing those responsible for the process of performance. There is much value to be had in that and the Big Data market prospers as a result. Despite the availability of advanced business intelligence tools, though, business workers still struggle to find the one email or document necessary to complete the next urgent task. People waste hours looking for it, only to most likely recreate all that work when they can’t find what they need. Organizations lose millions of dollars per year to this lost productivity and typically don’t even know it. Companies implement traditional enterprise search to help employees, but only make searching more frustrating because those solutions do not leverage the power of the business worker’s brain. Web search – the Google paradigm – has allowed us to take search for granted. When doing a web search, however, users are typically searching for something authored by someone else and the system is using programmatic analysis to conduct the query. For a business worker, though, search is very different. The worker has a sense of what they are looking for because it is very specific to them – the method of analysis is personal, not programmatic. Web search is inquisitive in nature. But, the web search approach – which has been pushed on users by IT for years – does not work well for business workers looking for the information needed to do their jobs. The Google paradigm also ignores the challenge of scalability. Indexing the enterprise for a centralized enterprise search capability requires major investment. In addition, centralization runs counter to the realities of the working world where information must be distributed globally across a variety of devices and applications. The amount of information we create is overwhelming and the velocity with which that information moves increases daily. The image above is of a Google Data Center (one of more than several dozen that power the internet). Look at the sheer magnitude of just what it takes to power those Web searches we are all so used to. This illustrates exactly why it is so hard to “Google the enterprise.” And yet many people, and even CIOs, think doing so should be easy. Such has been the approach to scaling traditional enterprise search solutions in the enterprise. And while Google obviously has solid software to drive its web search, hardware and sheer computing power on a massive scale are essential components of Google’s success. The only “successful” enterprise search deployments – as judged by customer references – tend to exist only in a very specific type of organization: highly regulated, with deep pockets. These organizations can make enterprise search work because, due to regulatory and Legal drivers, they have unlimited budget for hardware to make the solution scale. They are also able to invest in double digit FTE’s to implement and maintain the system over time. But, these organizations represent “the 1%.” Most organizations do not have the budget or human resources needed to make traditional enterprise search work. There will always be hardware investments required to make productivity search work, but such investments do not need to be heavy in the way that traditional solutions have been. Rather, organizations should look at more flexible options that mirror the realistic IT environment they live in. That environment typically includes a hybrid of on-premise, virtual, and cloud-based infrastructure and content spread across multiple repositories. Rarely – if ever – is content centralized. As such, a good productivity search solution will allow access to the content that business workers need the most while leaving as little footprint with IT as possible.